An interview by Michael Beliveau for Muzzleloader Magazine. “The only interesting rifles are accurate rifles.” Those are the words of Col. Townsend Whelen, who was perhaps the best outdoor writer of the twentieth century. 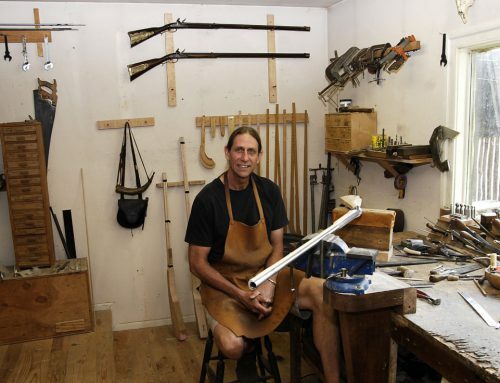 But those same words could easily be attributed to longrifle builder Tim Williams. Tim is a dedicated flintlock hunter who expects the guns he builds to reliably put meat on the pole. As I was talking to Tim, he was working on a York County rifle for himself. 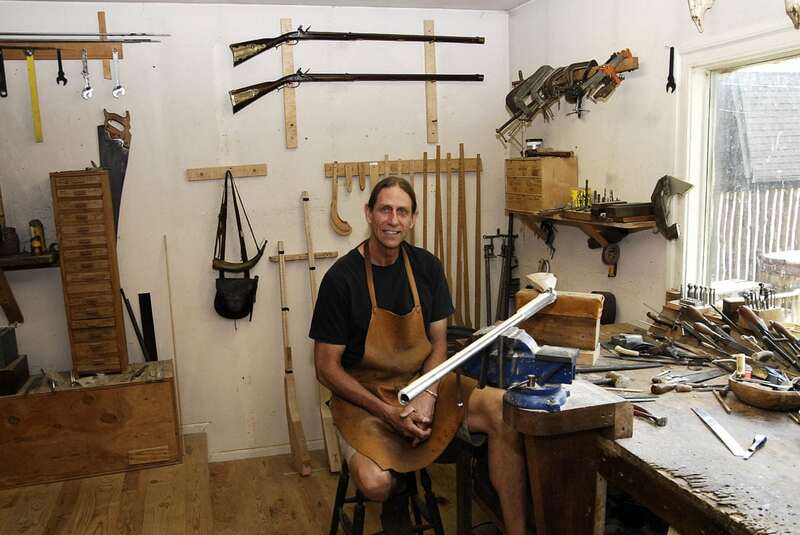 He was building a .58 caliber rifle based on an original, 1770s rifle made by York County gunsmith George Schreyer. Tim plans to use it for a moose hunt. As it turns out, moose is just one of the few major North American game animal that Tim hasn’t harvested. I remarked that .58 was a pretty big bore for moose. I told Tim that my friend, and fellow gun builder, David Price took the New Hampshire state record moose with a .54 caliber gun. Tim acknowledged that a .54 will take most anything on four legs, but when he shot a buffalo, he used a .54 caliber gun, and he found himself wishing he’d brought a .58. So, when he goes for moose, he’s going to pack a .58, just to be sure. Tim’s dedication to hunting with muzzleloaders is even more impressive when you consider that he resisted the siren call of black powder shooting for many years. Tim’s good friend, Brian LaMaster, tried to interest him in shooting muzzleloaders, but Tim resisted. Finally, after 10 years, Brian convinced Tim to shoot a flintlock rifle, and, as has happened to so many of us, with his first scent of aromatic gun smoke, Tim was hooked for life. It wasn’t long before shooting muzzleloaders led to a desire to build muzzleloaders. Tim had long felt an affinity to eighteenth century craftsmanship. Before becoming a professional gun maker, Tim’s profession was home building. During a trip to colonial Williamsburg as a young man he developed a fascination with eighteenth century architecture. 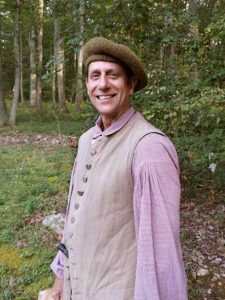 Tim started incorporating those colonial period designs into houses he built, and, as he did, he became more interested in the history of the era. 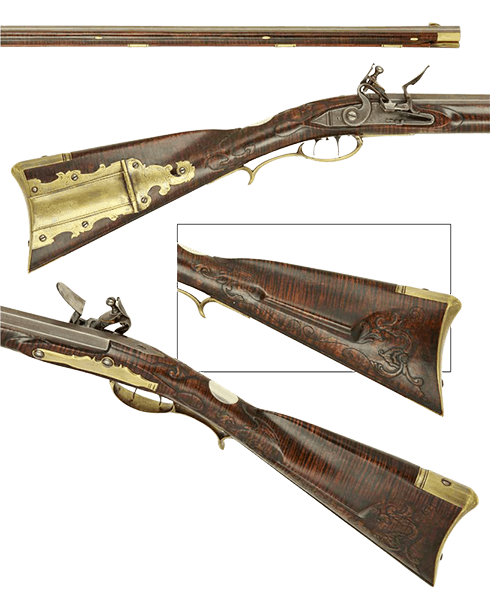 Building flintlock guns became a natural direction for Tim to travel. It melded his interests in eighteenth century history and craftsmanship with his new-found love of hunting and shooting with muzzleloaders. When Tim decided to build his first longrifle he had an advantage that most of us can only dream about. His friend and shooting buddy Brian LaMaster is also a nationally recognized gun builder. Brian was happy to advise Tim as he worked on his first rifle. Brian became Tim’s gun- building mentor, and he still provides Tim with valuable advice. The problem with building a gun that successfully harvests game, is that all your buddies want to buy it from you. Tim couldn’t seem to hold on to his personal guns for long. But, it did give him an excuse to build another, and another…Tim still can’t keep his personal rifles for much beyond one hunting season. I asked Tim what he thinks of his first rifle these days. In Tim’s view, correct architecture is the most important factor in building a proper eighteenth century gun. “Of course, you have to make some adjustments so the rifle fits the shooter,” Tim says. You can’t shoot well with a gun that doesn’t fit you.” That’s why he likes to personally meet the person he’s building a gun for. He wants to make sure the gun will fit, and that it will be suitable for the purposes the owner intends to put it to. In Tim’s opinion, that has always been important. “A gun has to fit, and it has to work…every time,” Tim said. “In 1770 when a man bought a gun and headed off to the frontier, if the gun failed, that man died.” It may not be life and death today, but Tim approaches fit and reliability as if lives are still in the balance. Tim is drawn to the earlier rifles of the 1760s through the 1780s. “There is something about those guns that just feels right,” he said. That’s why he likes to build guns that replicate a particular original as closely as possible. As Tim says, the best builders of the eighteenth century, like Isaac Berlin, John Shuler or George Schreyer, were at the top of their game. It is hard enough for him to equal their work, let alone improve on it. So Tim likes to approach his work the same way they did. He always starts with a full plank. “You can go anywhere if you start with a plank…any style of gun, any length of pull, Tim said. “If you start with a profiled stock blank, you are already locked in to some dimensions.” In fact Tim makes most of the furnishings for the rifles he builds. Tim says, “People will ask me why I spend so much time making small parts like nose caps, when I could save time and money by just buying them. Tim does most of his gun work with hand tools. He uses a and saw to rough cut stock blanks and he uses a router to start out barrel channels, but most of his work is done with chisels and scrapers. Tim believes that he can’t do much to improve on the old ways. 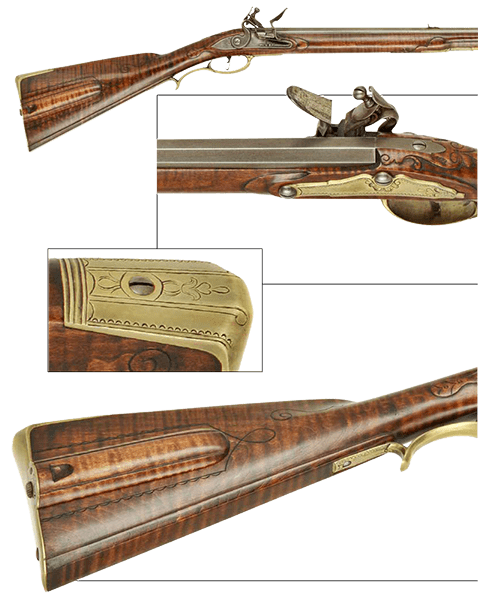 Tim believes that when you study original rifles, and closely examine the way eighteenth century builders actually did their work, you’ll see that doing it the same way that they did will usually give you the best result. That close examination is the key. When I asked Tim what has changed about his work over the years he didn’t hesitate over his answer. “I started building guns in 1999,” he said, “In the early years I saw the whole gun, and trying to re-create that is a tough job, there’s just too much to take in. Now I spend more time looking at…and I mean really examining…the details.” As Tim explains, that gun is made up of a myriad of details. If you concentrate on getting each detail right, in the end, you’ll have a finer gun. Not many people can make a living building flintlock guns. I asked Tim how he made the transition from part time builder to actually doing it for a living. He told me that it happened very naturally. For most of his life Tim was a homebuilder. When the housing market slumped seven years ago, his home building work slowed down. But, as one door closed another opened. As home orders declined, his gun orders were on the rise, and, like a natural process, the gun work increased until it was his main business. Tim is a member of the Contemporary Longrifle Association (CLA), the Kentucky Rifle Association (KRA), the National Muzzle Loading Rifle Association (NMLRA), and the National Rifle Association (NRA). Download the entire interview with photography by Ric Lambert.